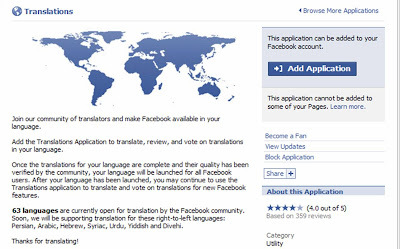 The new Facebook Translation application will see Facebook quickly adding more languages to the list of languages that Facebook is currently available in. Users can select their desired Facebook operating language at the base of any Facebook page. In much the same way that Google are speeding up their image labelling by using a public interface (Google Image Labeler) to harness the crowd, so Facebook are now seeking to use the same crowdsourcing technique with site translation. To date Facebook have used a combination of professional translators and Facebook user volunteers to translate the site. As translation gets harder and languages become more obscure, Facebook are using a new approach to Facebook Translation. Facebook aim to imminently launch in another 63 languages (including Asian languages, African dialects and random languages like Esperanto). These languages have been opened up for translation by the Facebook community through the new Facebook Translation application. Once the translations for a language are complete and the quality has been verified, the language is launched for all Facebook users. The Facebook Translation application is a clever way of using crowdsourcing to do big translation jobs quickly and as each new language is added, so Facebooks user base will continue to increase.